Aaron Sims needs little introduction. One of the most versatile concept artists working in films today, to industry insiders, he is revered for his multi-faceted approach to creature development. To audiences, he is the genius behind many of today’s most memorable movie monsters. Moving to Los Angeles in the mid 80s, Sims began his career as a special effects make-up artist, quickly attracting the attention of the legendary Rick Baker, with whom he collaborated for the next 12 years, working on movies such as Batman Forever and Men in Black. In the late 90s, Sims began working for another Academy Award winner, Stan Winston, with whom he later co-founded Stan Winston Digital, becoming lead character designer on Steven Spieberg’s Artificial Intelligence: A.I. Since leaving Stan Winston Digital to found his own studio, The Aaron Sims Company, Aaron has worked on a string of blockbusters, among them The Incredible Hulk, Clash of the Titans and Black Swan. But for his session for the Gnomon School of Visual Effects’ online Master Classes, which go out from 5-19 December, he will be talking about a very different project: his Hollywood directorial debut. In fact, for Archetype, a seven-minute science-fiction short, Aaron acted not only as director, but producer and art director, collaborating on the 60-odd visual effects shots with a small team at his studio. In the class, he discusses the challenges, both artistic and technical, of creating such an effects-heavy short, and demonstrates some of the techniques he used in pre-production, production and post-production. Viewers of the class have one further advantage: outside the production team, they will be the first people in the world to see Archetype in full. We caught up with Aaron to find out more about production, his advice for young creature designers – and which cameo Clash of the Titans director Louis Leterrier plays in the film. Updated 20 January 2012: Archetype has now been released online in its entirety. 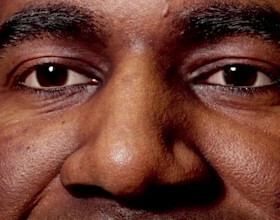 Click Play to see it. CG Channel: So what is Archetype about? Aaron Sims: It’s about a robot who becomes self-aware and is questioned for having a weapon the company that built him never created. They don’t care for his self-awareness; they think he has a glitch. It’s about him breaking out to discover the truth. The short is a promo for a feature I have in development right now, so it isn’t your standard three-act structure: it’s more of an elongated trailer. People who take part in the Master Class will be the first ones in the world to see it – even before the studios. CGC: How many people worked on the film? AS: Around 50 people. That’s everybody, from the writer, to the actors, to the people on set, to the visual effects team. Rob Nederhorst, who’s a good friend of mine, was the VFX supervisor on the show, and I and a handful of people – five, probably – did all the effects. Neil Huxley, who was the designer for all the HUD stuff in Avatar, created the HUDs for the movie. We used his designs and finished them here internally. The HUD elements in Archetype were created in-house at The Aaron Sims Company, from original designs by Avatar’s Neil Huxley. CGC: Who wrote the script? Is it your own story? AS: The story was my idea. I worked with Zach Parris, who’s a friend, and who was initially working here [at The Aaron Sims Company] at the time. We’d bash round the idea of this robot being self-aware and being interrogated, and he turned it into a ten-page screenplay. CGC: How did it feel to go from art director to just plain director? Luckily, I had Robert Joy [CSI: NY] and David Anders [Heroes, Vampire Diaries], so I really just had to guide them. That was definitely a bonus for me. I had done a short in the past where it was more like friends, and for a first-time director, I definitely don’t recommend that. The last thing you want is to have to tell an actor how to act. A still from Archetype. The human cast includes veterans of such shows as CSI: NY and Heroes. CGC: Did you talk to other VFX-artists-turned-directors, like Neill Blomkamp or Phil Tippett? AS: You know, I didn’t. I highly respect Neill, and Phil Tippett I’ve worked with in the past, but as artists, we all have our own path. But I’m designing for directors all the time, so I do ask their advice. Louis Leterrier, who directed Clash of the Titans and The Incredible Hulk, plays one of the robots at the beginning of the movie. They’re slaughtering the rebels, and before he is able to shoot this little girl [played by Leterrier’s real-life daughter], our hero robot stops him with an EMP blast. He was a great asset, because he’s done so many action films. We were out shooting at a park and had limited time and a limited budget, so it was great I had someone like that on my side. CGC: So what was the budget of the movie? AS: It ended up being $30,000 in total. For the amount of visual effects in it, that’s pretty remarkable. Our team built the sets from scratch, and I think that ended up being under $10,000. A lot of the budget was in the production. Once we got into post-production, we did it internally; a lot of people did it as favours, and that’s why we were able to get the cost really low. It was a test piece, and everybody learned a lot in the process. Concept art for Archetype. The Gnomon Master Class takes viewers through the entire production process, from idea to final result. CGC: Let’s talk about the Master Class itself. What do you hope people take from it? AS: I’m hoping that people get inspired. I’m hoping they see that whatever idea they have, there’s no limits – no matter how long it takes. I’m hoping that people will get fired to do their own thing. CGC: So what fires you up about your own job? So many people complain about remakes – and I do love creating my own content, like Archetype – but it’s so amazing for me when I get a chance to work on material that I’m familiar with, whether that’s an old movie, or a comic book from my childhood. I worked on the reboot of Planet of the Apes, and that was one of my favorite films as a child. I was obsessed with it; I used to do paintings, drawings, everything. And when it came back around – I didn’t get a chance to work on the Tim Burton version – that was such a thrill. It enabled me to tap into my childhood fantasies. CGC: That’s interesting, because a lot of people would see remakes as money-making opportunities, not creative ones. AS: Well, a lot of creative decisions in movies are made by committee. I work on a lot of projects where the directors are told by the committee what they should be doing. I understand that on certain levels, but not on creative levels, and that’s where I’m hoping things are going to change. It takes the right type of director to break through all that – a James Cameron or a Chris Nolan. It takes a strong individual with ideas, but even then, they have to be proven before they’re listened to. 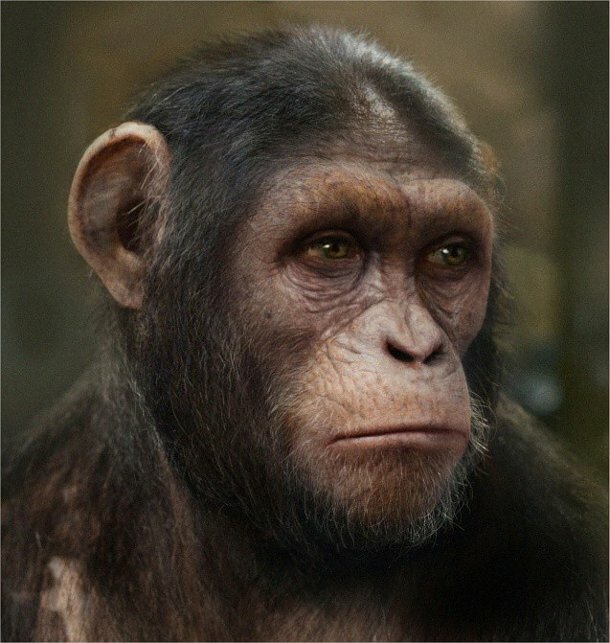 A finished concept image for Caesar from Rise of Planet of the Apes. The opportunity to work on the reboot of a childhood obsession was a particular thrill for Aaron Sims. 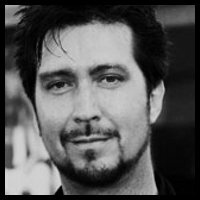 CGC: Do you feel that the work of creature designers is recognized enough? AS: I’ve worked in make-up effects artist, in visual effects, and they all have a job title that people can get awards for. They get appreciation based on those awards. But as a designer – unless you’re a production designer – there’s nothing out there, no award, at least not yet. It’s funny, because there are some movies I’ll design so much on, and they don’t even know how to put me in the credits. There isn’t even a proper credit for creature designer. CGC: What advice would you give to a young artist hoping to follow in your footsteps? AS: Again, it’s all about inspiration. With software like ZBrush, people can create almost anything they can imagine, so it really is just a matter of building a portfolio. If you’re inspired, do something and get it out there. There are so many free blogs where you can put stuff on the internet, and if your work is good, you will get a job. I find a lot of the artists for my company from blogs. CGC: So what’s next for you as a designer? Is there anything left that you haven’t already created? AS: I think I’ve designed pretty much everything: robots, aliens, mythical creatures. But to me, there’s no end to those designs. It’s always inspiring me when I have to redesign a creature in a way we’ve never seen before. It’s the same as stories, there only seven major stories in the world, and they’re constantly rehashed and remade. What I try to do as a designer is to create characters that feel familiar, even though they may look very different. There are so many designs I’ve seen that have gone outside the box, and sometimes they’re really interesting, but they’re often hard to relate to. I always strive for some element of humanity in my designs. If a design becomes too abstract, it has less of an impact.